You are currently browsing the category archive for the ‘culture shock’ category. I think this will be the last part! (unless I decide that Korea gets its own post…) Then I will return to my regularly-scheduled life, which is actually far from boring. This week, for example, I sat with a newly-arrived refugee (she’s been here a month) and admired the way she has made a home from other people’s furniture–faded red couches, light teal chairs, a new-but-dinged dining room table. 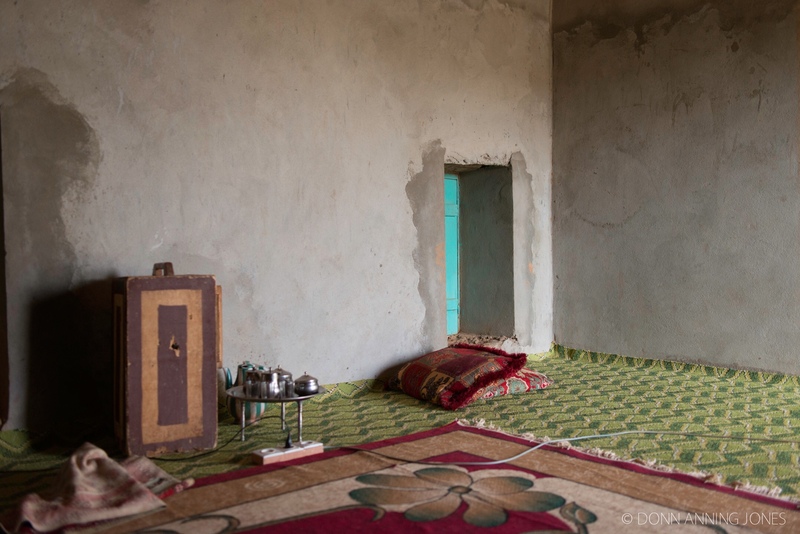 She has decorated with embroidered cloths brought from Iraq that tie the colors in the room together. She insisted I eat with them so I did, even though I’d already had lunch a few hours earlier. She proudly showed me how she’d arranged her tiny bedrooms, and I saw her teenage son taking a nap on the single bed in the room he shares with his 22-year-old brother. But enough about my current life…let’s finish Thailand! This is the first thing you should know about Thailand: everything is SUPER cheap. You can get an hour-long massage for $6. You can get a mani-pedi for $10. You can buy a plate of fresh, hot Pad Thai for 65 cents. You can buy a journal made of paper that is made from elephant poop for $1. You can buy Thai silk scarves, in gorgeous colours and patterns, two for $3.50. Get your hair highlighted for $15. “I could get used to this,” you will think. Spa treatments are very cheap! And you’re not the first. We were in Chiang Mai, and it is hands-down the place with the most tourists I’ve ever been, with the possible exception of Paris. Of course I’m used to Nouakchott, which rarely makes the list of Top 10 Places on the Planet to See This Year, but still. I’ve been to London. I’ve been to Marrakesh. 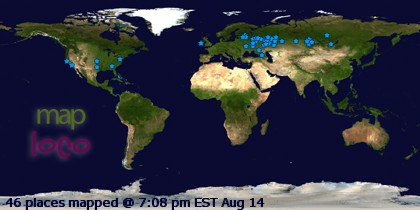 Never before have I been in a foreign land where I stood out so little. They were used to people like me only, in general, younger, thinner, showing a lot more skin, and actually looking good in the baggy elephant pants. I didn’t look good in the baggy cotton elastic-waisted pants, but I did get food poisoning or something so I didn’t care, because I didn’t feel well and they were so comfortable! And cheap, of course. $2/pair. I didn’t buy any for myself, knowing they wouldn’t be flattering, but we had bought several pairs for Ilsa and then I took the purple ones. She still got 5 pairs to share with her college roommates. (I know this from snapchat) Donn, on the other hand, looked good, and loves comfortable cotton clothing that we might call ethnic, and he now owns more Thai clothing than many actual Thai people. He could probably clothe an entire small village. Donn photographing a shrine. Apparently I have no real photos of him; I included him in this one to give an idea of the size. But you can see his comfortable, loose cotton clothing. It was very hot and humid even in November, and jeans were right out. Also notice the shrine. They were literally everywhere–most businesses had one inside and one out, and there was at least one public shrine or temple per block. Since we were celebrating our 25th wedding anniversary, we splurged for luxury, and stayed in the nicest hotels. One was $40/night and the other was $50, but we were living it up! I spent two entire days sitting by the pool and reading books and going for dips, because that is my definition of complete relaxation. Donn gets bored so he’d go out exploring, get a massage or two, join me for a bit late afternoon, then we’d go in, shower, and go out for dinner. Pool. Picture taken in morning. It curved round the side of the hotel and was very refreshing, since it wasn’t heated. It was surrounded by deck chairs to lounge on, and there were umbrellas to shade under (I really didn’t want to burn). It was, in a word, absolutely delightful (oh I was never good at math). We did touristy things. We rode elephants. We arranged this by stopping by a random barber shop with a table outside covered in brochures. The very sweet woman who manned it in between hair customers was named Ma and she spoke enough English to get by with people like us, who spoke no Thai beyond “hello” and “thank you.” She pulled out several brochures, made some phone calls, and arranged for us to be picked up at our hotel. Next day, we were picked up in a nice, new, air-conditioned 15 passenger van and driven into the nearby mountains to an elephant farm. We fed them bananas, which they slurped up so eagerly that I couldn’t decide if they were being starved or if they just love bananas and always slurp them down eagerly, leaving little bits of elephant slobber on the proffering hands. Then we crossed a bridge over a river and went to a sort of platform halfway up a hill. The elephants walked through the river and then up to the platform. We left our shoes on and stepped on their heads, which I found stressful but they didn’t seem to mind. They each had a little bench tied onto their backs, and we settled ourselves there (2 people per elephant. That was specified in the brochure. You don’t get your own elephant.) A driver settled himself in front, on the elephant’s neck, and we were off for a ride that was mildly terrifying, to be frank. We were up amongst the forested hills, and the elephants (3 of them) headed up a steep hill. The elephant swayed back and forth, up and down, as we went up an uneven tiny track that wove in and out of the trees. That was all right, but when we were going straight down the other side, I started to slide forward and nearly fell off the elephant. My bag kept going but I managed to catch it with my foot. I had to wrap my arms through the little railing across the back to stay on. So it was a little stressful. The elephants walked for about 45 minutes, through the forest, through the river, past the most enormous spider I’ve ever seen–big as my hand!–and back to the platform. Afterwards we walked down to the river where we bathed the elephant while the handler tried to get it to splash us. It was more fun than I expected. Then we went back across the river and played with a month-old baby elephant for a bit. They let us get in the pen and play with it. It was kind of shy, and mostly liked the handler best. They played chase. It was pretty cute. Our first night in the desert in years and years. 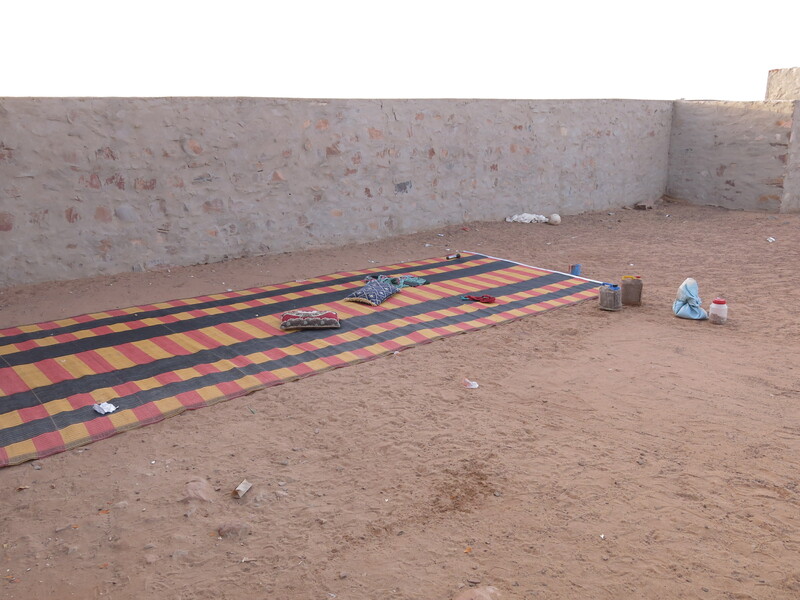 (Nouakchott doesn’t count, even though it is in the Sahara, yes, because there are houses there that often have electricity and running water) As the sun began to sink, Yahiya’s daughter, aged 9, dragged two large plastic mats out of one of the rooms, and her brothers fetched large rocks to weight down the edges. I sat down and one of the kids went running into the room to bring me out a hard cushion to put under my elbow. Although electricity has come to Oudane, it hasn’t really made its presence felt. Yahiya’s compound has a single fluorescent bulb, and an outlet in each room. In the evening he plugs in a lamp and drags it outside to the second of the two mats, where his children do their homework. Yahiya is a teacher in the local school and rents out one of his rooms to another teacher. This proved to be problematic in the middle of the night, when it got cold and the family moved indoors. He was in his room. I wasn’t sure if I could go in there too. Donn did, thinking I was still asleep, and I lay there shivering the rest of the night and wondering what to do and being irritated at Donn for going in without me, even though I knew this was irrational and that he would feel terrible when he found out. (He did.) And it turned out that it would have been fine to go into this unmarried teacher’s room, but how was I supposed to know, in this very conservative Muslim village where daily life is mostly unchanged for centuries except that now, fish is trucked in daily from the coast, and apples are available in the local merchants’ shops? Where, when I visit an old friend, her husband rushes out to buy me a muluffa so that I’m soon enveloped in bright blue cloth? Donn and I quickly feel the 12 intervening years since we last slept on the stony ground of Oudane. I lay down on the hard ground, wrapped myself in a purple muluffa for another layer of warmth (dubious since they are made of very thin cotton), and felt the ground digging into my hips. In the morning I felt bruised, but as the sun came up and whisked away the remaining coolness of the night, I dragged myself inside to face sweet mint tea when I longed for black coffee. The bread was fresh and hot, bought at the local bakery. Yahiya had to work so we spent the day wandering the town, meeting people. 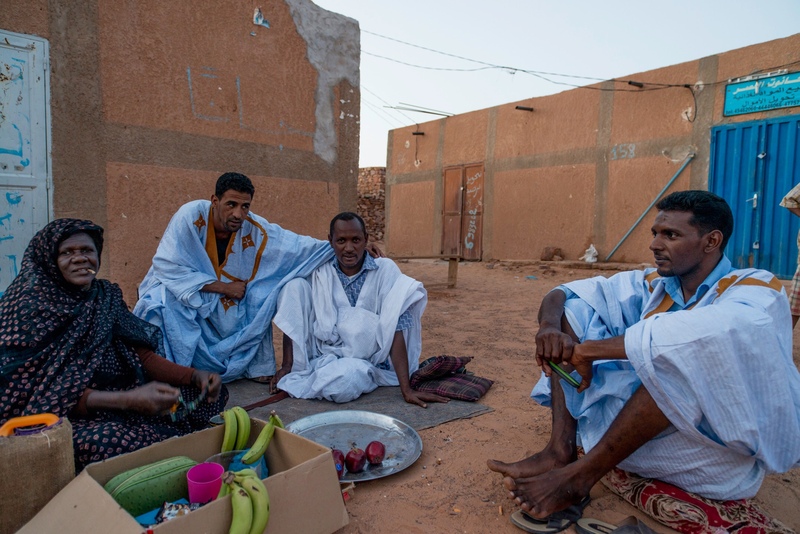 In Oudane, people tend to sit outside their houses/shops on mats spread on the ground, drinking tea and chatting. We would greet people in Hassiniya and they would invite us to join them. We drank glass after glass after glass of sweet mint tea. 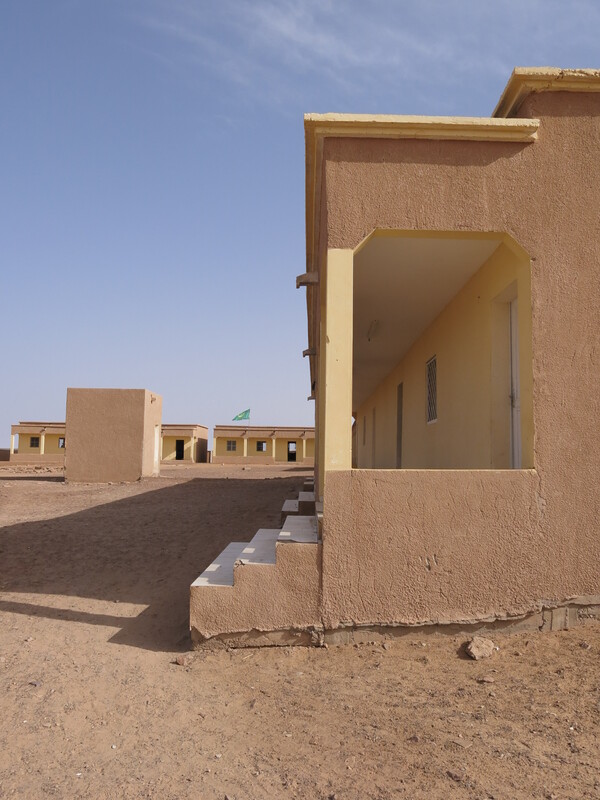 Many people remembered us as the parents of those 3 tiny blonde children (even though Elliot has never been blonde in his life), because even though this is a relatively touristy part of Mauritania, few people bring their kids and stay for a month. In the evening, we walked again through the ancient city. 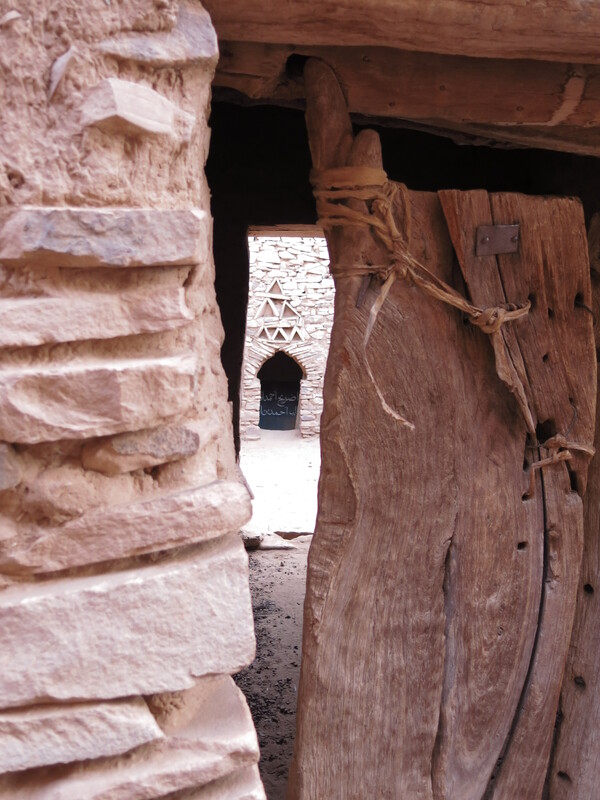 Peering through a doorway into a shrine, a place where a local holy man is buried, where people visit seeking blessings and good luck. 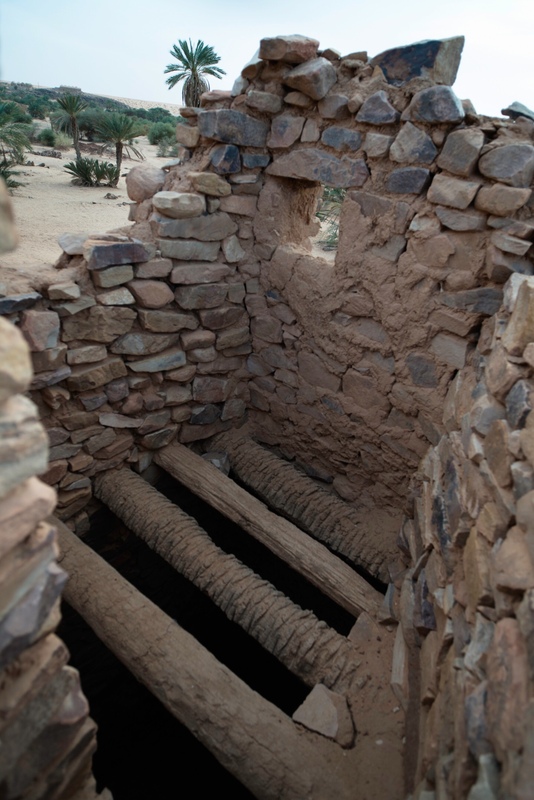 Places like this are frowned on by classical Islam but are very common throughout Morocco and Mauritania. That night, Yahyia’s wife serves us a dish of camel meat cubes with macaroni in a creamy sauce. We eat it with our hands, of course. I can’t help thinking this could be the next new thing in America. Kraft Kamel Mac’n’cheese! Can’t you see it? Of course they will spell camel with a K. I can’t wait to tell Abel, who loves Kraft mac’n’cheese (traditional flavor), but he turns up his nose. He’s not a big fan of camel meat. I don’t know why, since it tastes almost exactly like beef, just a little different in some undefinable way (thinner, somehow, or perhaps drier. I don’t know). It’s snowing on my blog! It’s freezing in my house! The wind is wuthering and banging things and howling down the chimney! 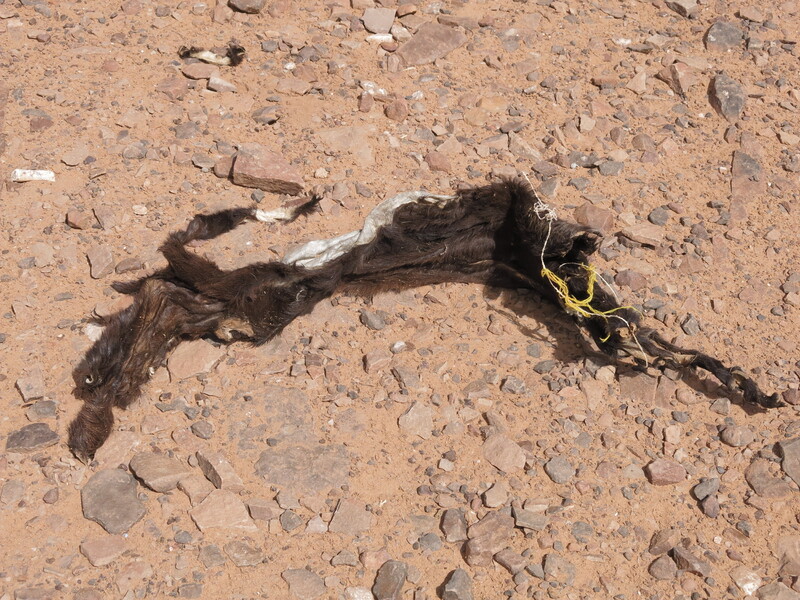 And yet I continue to write about my recent trip to the wilds of the Sahara desert. I’ve been having a lot of fun telling my Iraqi friends about our trip to Oudane and showing them the picture of the toilet. They are amazed beyond. They laugh hysterically as I describe the uneven stairs, but when I explain about balancing on the rafters, they are horrified. “What if you fall in?” I’ve been asked several times. 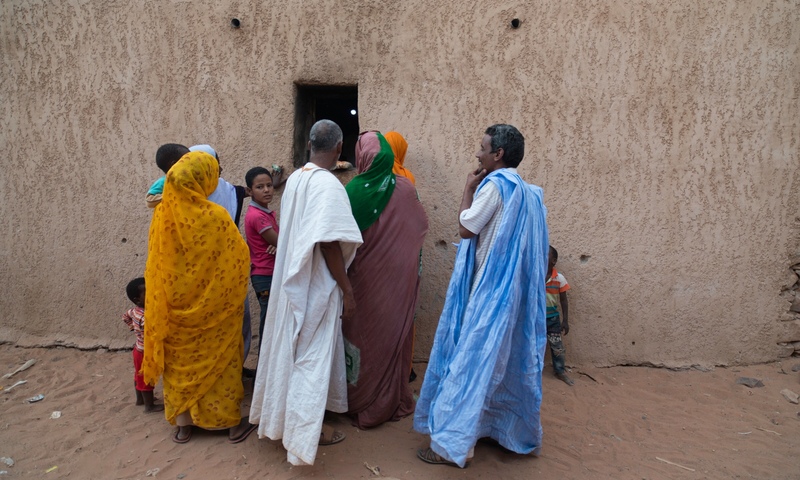 They are shocked to hear of how poor many Mauritanians are, and can’t believe I survived even 3 days in the tiny village. 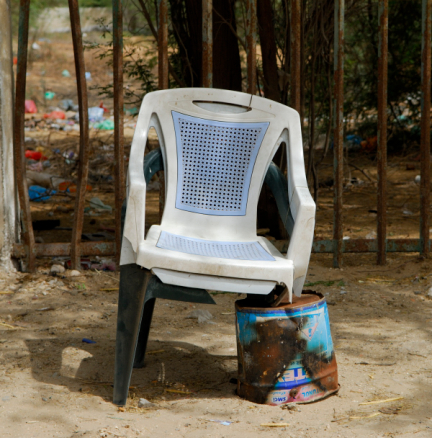 One woman told me of a time she and her family had fled Baghdad during the war to a neighbouring village, and how they didn’t even spend the night because of the primitive toilet. I laugh. “I lived in Oudane for a month once, with little kids, and the whole family had giardia,” I tell her. This time, we arrived in Oudane on a Monday afternoon. In the morning, we met our driver outside our friend’s business. 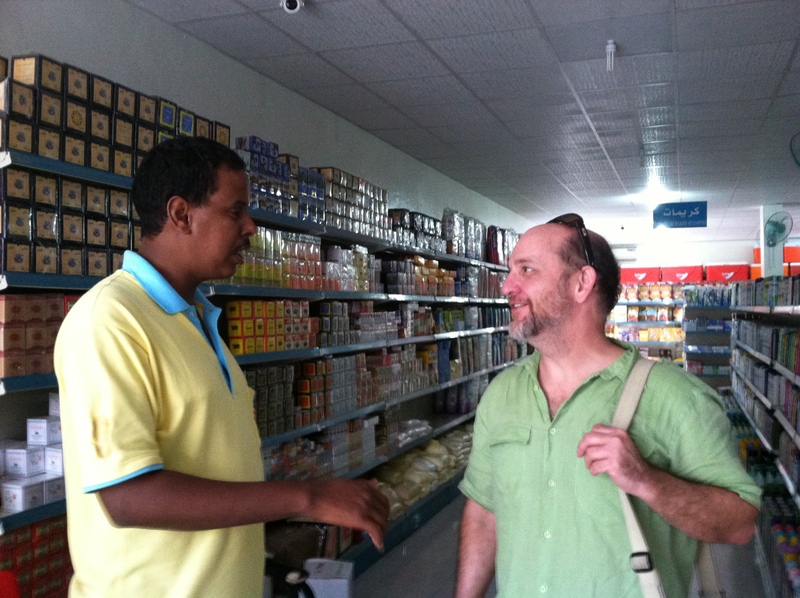 This friend, Mo, is doing tremendously well in business and is very generous to boot, and he arranged a car to take us the 600 kilometers from Nouakchott to Oudane. I don’t know what he paid but it was a lovely thing for him to do. We climbed in and the driver took off at a tremendous rate while I bounced around in the back. The sun beat down as we drove through the desert and I kept waiting for it to get pretty. It does, right around Tergit, where the baked plains that surround the city begin to rise into shale plateaus. I sat in the back, wishing the AC could be cranked, bored for hours and hours and hours. We stopped only at police checkpoints, of which there were many. At each they took our passports and laboriously copied down the information. And the day was long and hot and boring, but it was one of those times where I honestly didn’t mind, because I liked that security was tight and that someone pretty much always knew where we are, or could easily find out. The only negative was that the driver only stopped for police checkpoints, where you don’t want to pop out with your camera unless you’re the type of person who enjoys getting yelled at and possibly losing your camera. So I don’t have any pictures of the pretty part. 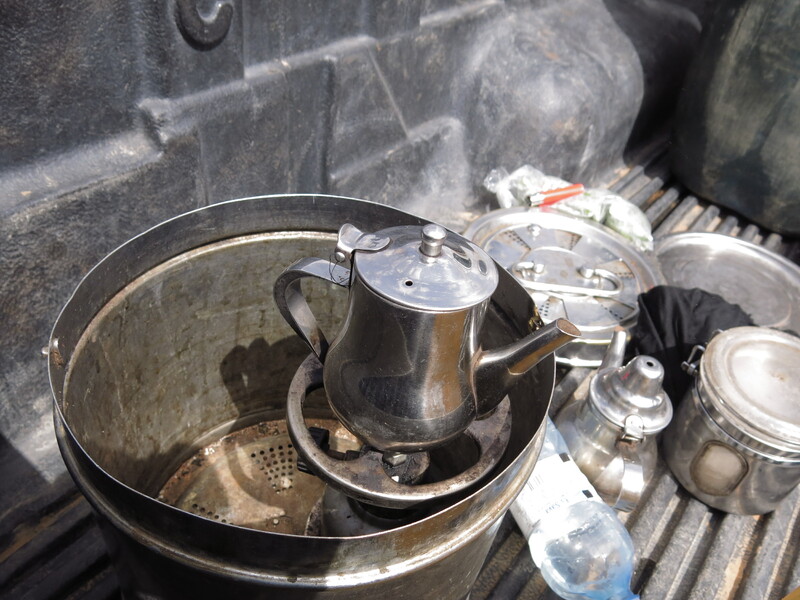 We only stopped once, just past Atar, for the driver to make tea in the bed of the pickup truck, out of the wind. I snapped a few photos, carefully making sure the nearby policemen could see I wasn’t pointing my camera at them. We drank the tea, ate some apples we’d brought, and took off again, beginning the climb up the steep, crenelated plateaus. The road is paved intermittently, so sometimes you bump along on gravel, staring down the side of a cliff without a guard rail, but it’s really not bad and we were soon at the top. We arrived in Oudane about 4, and met Yahyia walking down the street towards us. He was our first Arabic teacher, and the reason for our visit. We hadn’t seen him in 8 years. Oudane is not a big place. The population is 2500 or so, and the way of life there has changed very little in the centuries since it was founded as a center for Islamic learning in the area. Ways of the desert die hard. The first time we visited, complete strangers took us into their home, sat us down and fed us, and offered to host us for a week. We spent that first evening sitting round the courtyard, meeting Y’s wife and 4 kids, being fed 2 meals since we hadn’t had lunch and couldn’t convince them we weren’t hungry, and wandering round the old city of Oudane, which is gorgeous. 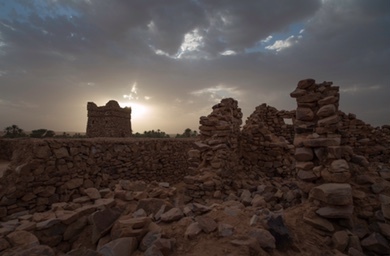 It’s a UNESCO site, one of the 4 ancient cities of Mauritania, and finally “they” are getting around to restoring it. Y tells us that various NGOs have participated, making sure the stones are again reset using only the traditional manner. We walk down to the oasis and then wander up along the Route of 40 Scholars to the top, where the modern city begins. As usual I’m getting into too much detail. “Skip a bit,” Donn urges. I will, next time. During the summer of either 2002 or 2003, Donn and I took our 3 children to the village of Oudane for a month. We had visited this village during the month of February, when the moon was so bright that you didn’t need a flashlight to cross the rocky courtyard at night. 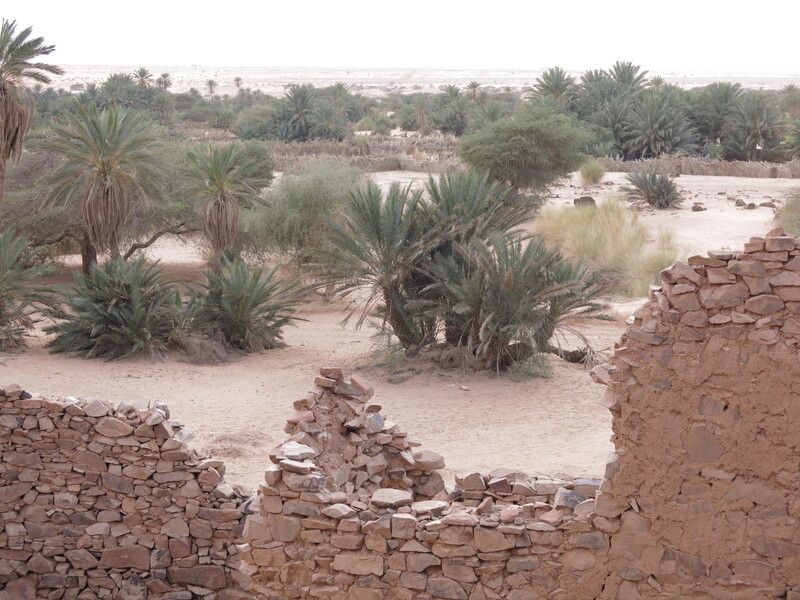 Oudane is one of Mauritania’s historic cities. 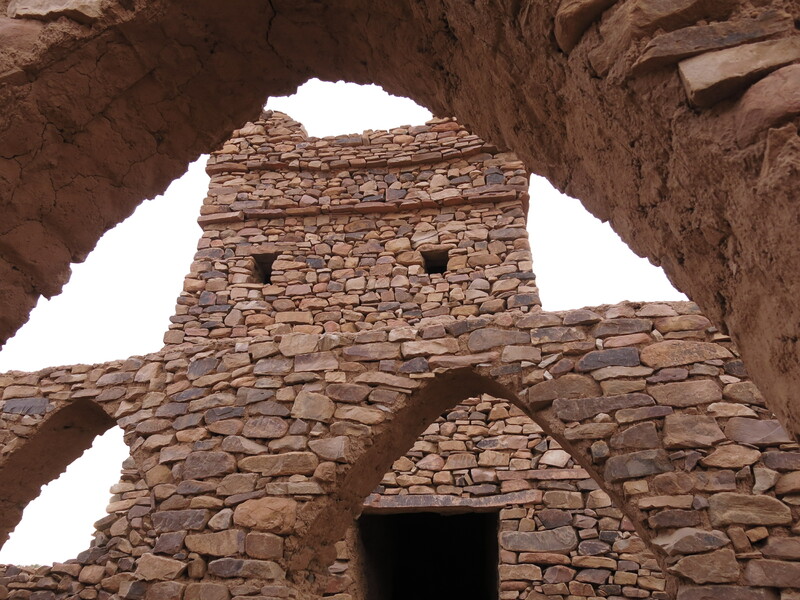 Built in the 1200s by 40 scholars, who lived in a madressa and left each morning to teach others the ways of Islam, it is situated on a rocky plateau that rises above the desert plain. At the foot is a large oasis of date palms, divided off by palm leaf fences to keep out the goats and where small plots of mint, carrots and potatoes are tenderly cared for. We moved from Mauritania in July 2007 and the country kind of fell apart shortly afterward (no I don’t think these 2 things are related), with several Westerners killed, a suicide bomber just outside the French school, and many Western aid workers kidnapped and held for ransom. Last year, our first visit back, the capital felt different, unsafe in ways it hadn’t before. We had no way of knowing if this was our imagination or not, but it wasn’t helped by Mauritanian friends telling us to be careful and avoid certain areas, and official warnings not to travel outside the city. 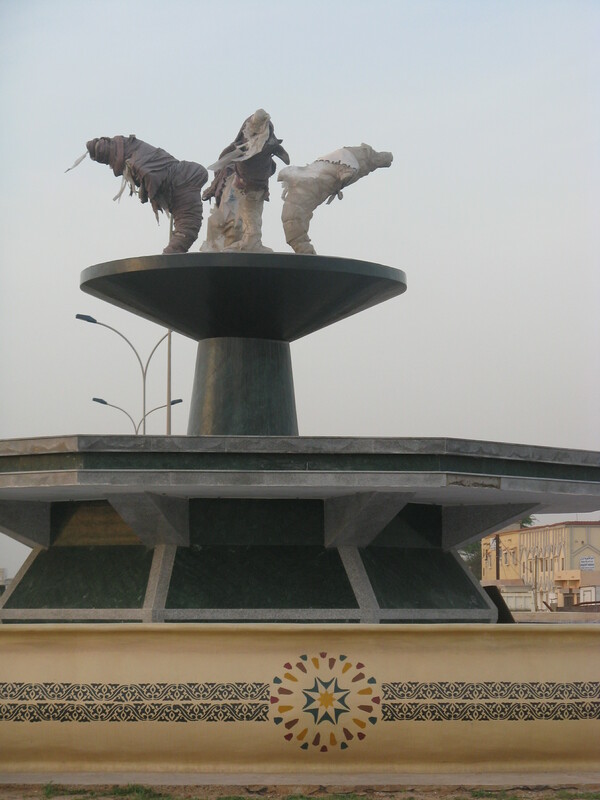 This year, Nouakchott felt back to normal–dusty, bustling, busy, safe. I was happy about this. I wish my former home all the best and want it to succeed, and terrorism kills growth, along with so much else. The official warnings had been moved too. Now it was considered safe to go as far east as Chinguetti. Oudane is located about 30 km northwest of Chinguetti. And so, we decided to return to visit our friend Yahiya. 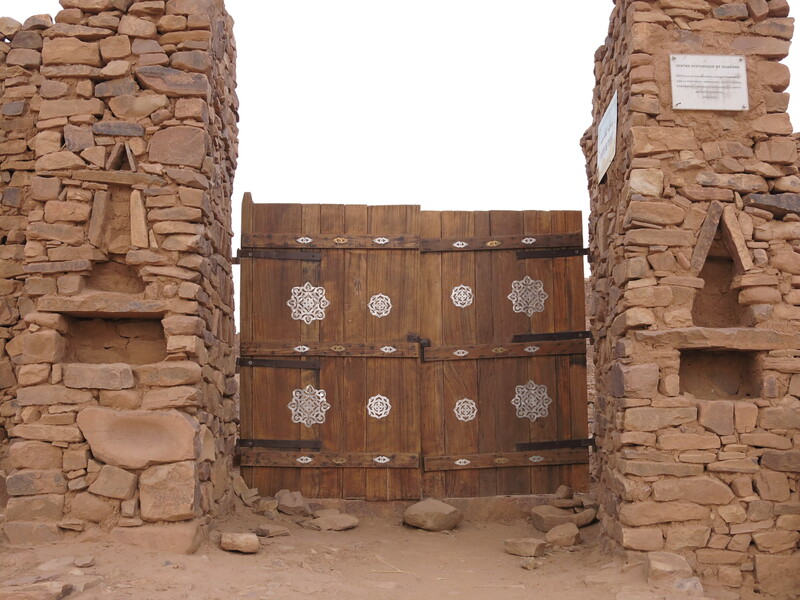 Since this is your introduction to a Mauritanian village, let’s take a moment to look at the houses of Oudane. First a wall is built around a rocky courtyard. On one side are 2 or 3 rooms, bare concrete with low windows, which makes sense for people sitting on the floor. (There are no couches or chairs here, just a thin rug over a concrete floor and a hard cushion for your elbow) The windows are simply holes in the wall with wooden shutters, painted a bright green and sandblasted to that country chic look so popular a few years ago. The side of the yard nearest the street has 3 tiny rooms. The kitchen is an unadorned square with a dirt floor; the shower is a tiny room with a slanted cement floor and a hole through the wall that drains into the street outside. Upon shutting the door, the room becomes pitch black until your eyes adjust to the small streaks of light leaking through whatever cracks there are. Usually there’s a bucket of water there. To shower, you dip cups in and pour it over your body in the dim, dank twilight. The third room is the toilet and it’s like nothing I’ve ever seen before. 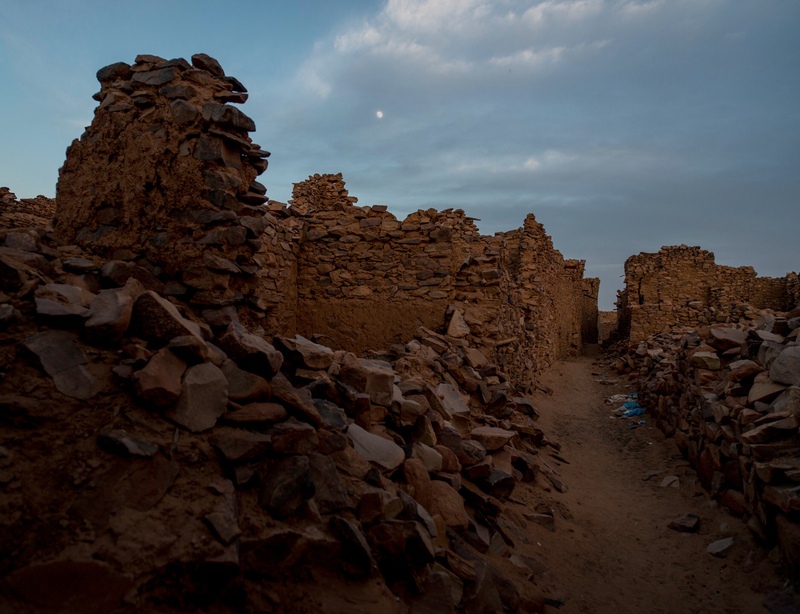 Holes in the ground are common in Mauritania, but Oudane is built on a large rock plateau, and the ground is too hard for digging. Instead, you mount uneven rock stairs and come out on the roof, in full view of the village children, who wave and call to each other to come look at you, until you duck behind the low wall. Below you is an empty room. You balance yourself over it on rafters made of split palm logs, which creak and bend alarmingly, and relieve yourself into the dank below. When things get too smelly, someone dumps charcoal ash over the growing mound. When the rooms get halfway full, it is someone’s uneneviable task to open a door into the wall and shovel it out. I don’t know where it is then deposited, but my guess is that it is dumped into the desert somewhere, or possibly used to fertilize those tiny patches of mint. We were pleased to discover on this trip that the flexible palm trunks have been replaced in the newer homes by rafters made of rock. Much firmer. Would Oudane have changed in the 8 years since we’d been there? We’d heard they had electricity and cell phones now, which would be a welcome change from before. 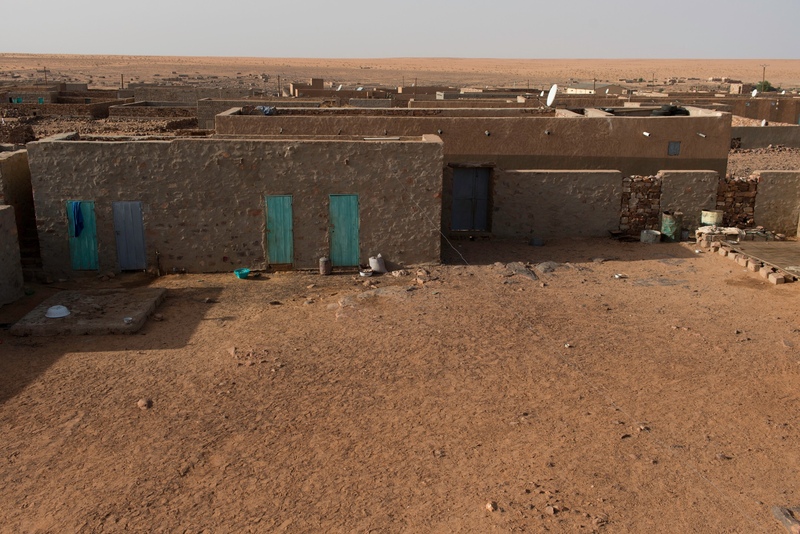 But, given the almost primative nature of a Mauritanian village, it was hard to imagine huge changes. Why yes, I’m still working on telling you all about a trip I took last fall. Hang in there. Only a few more posts, and then I’ll go back to posting once every three months. 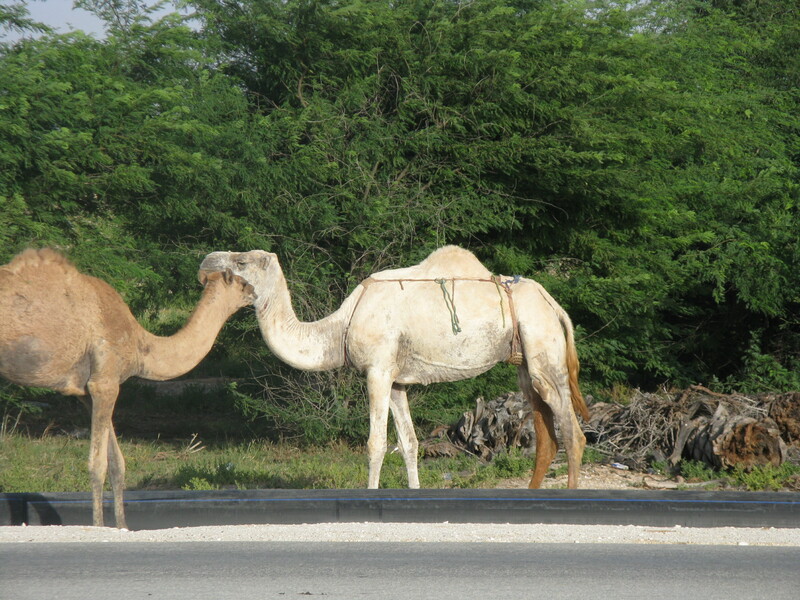 When we first moved to Mauritania, I was amazed at the driving. It was like nothing I’d ever experienced before. We’d lived there only a few months when 3 kids racing horses down the street flew around a corner and smashed a horse up onto our car, leaving the horse screaming in agony with a broken leg (they didn’t put it down either; the poor thing lived another week). They claimed it was our fault, and the police agreed after a rapid discussion in Arabic in which some money may or may not have changed hands. 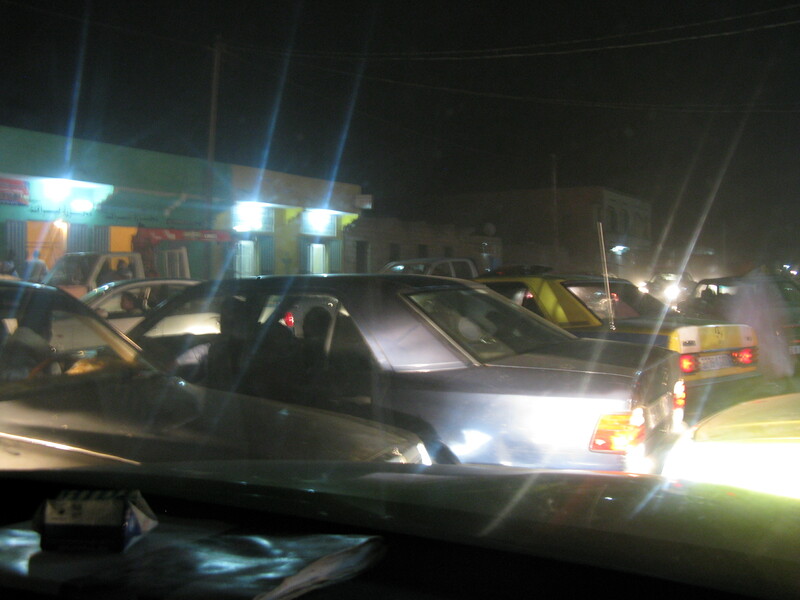 Driving in Mauritania was never ever relaxing. Stopping for a red light was like a jeopardy game. You know how the contestants wait with their hands on the buzzer, and the instant the question flashes they hit that buzzer, only to sometimes realize they don’t know the answer? That was what it was like. The instant the light changed–literally before you had time to move your foot from the brake to the gas pedal–the honking started. Some events remain green in my memory. The woman in the pink muluffa driving 5 km down one of the main streets with her eyes closed, muttering prayers as her car drifted dangerously near mine. The donkey cart in the right lane suddenly swerving in front of me to turn left. Me jamming on the brakes and shouting and gesturing a bit (not rudely, just exasperatedly) and the children being so embarrassed. The habit drivers had of simply stopping their cars in the middle of the street and getting out and going into the school/shop/wherever. The pointless traffic jams where each car claims each inch of space it can, resulting in a full intersection of angry people and no one going anywhere. This is my attempt to show you a pointless traffic jam. This is a normal intersection. In America, there would be one lane of traffic going each way. We are headed towards those buildings. The picture is taken through the windshield of Aicha’s car and you can see the hood and the direction we’re pointing. I’m not sure this picture does it justice, but I knew no one there would want to be photographed. As bad as Mauritania was, Morocco was worse. The driving was the same, except there were more cars going faster, since streets were paved, and there were high curbs and sidewalks, which took away your getaway. (In Mauritania, even paved streets have wide sandy shoulders filled with children and handicapped people that you can swerve into if necessary.) Morocco was insane. 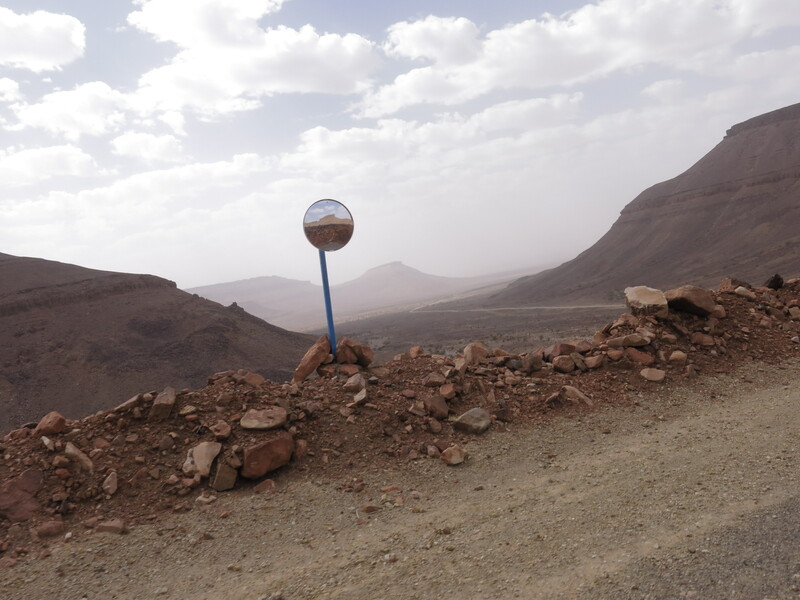 If Mauritania was hell on wheels, Morocco was the 9th circle. But I learned to love the challenge. There was one road that I always felt would be instrumental in teaching fractions. It was divided in half (one half for each direction) as normal, but the entire road was also divided in thirds. This meant 1 1/2 lanes for each direction. Naturally Moroccan drivers were able to turn this into 3 lanes for each direction. I found it just as effective as anything else to simply close my eyes and use the force to steer. When we first came back to the US, I found the driving tame and insipid. I tend to express my feelings vocally while driving, and I would sit at the green light muttering “GO!” at the car in front of me while Ilsa chirped, “Use the horn, Mom!” from the back seat. Seriously, she could not understand why her parents were suddenly so mealy-mouthed, so to speak. I tend to be a really impatient driver with a bit of a heavy foot on the gas pedal. I swerve (politely) in and out of traffic, making up time so I’m not too late, usually going ever-so-slightly above the speed limit, until I notice I’m 15 10 miles over and slow down. And this is on surface streets. I assumed I still had what it took to be on the streets of North Africa, so it came as a shock to find that I have become timid. I’d be sitting in a taxi watching a bus coming straight towards me, about to T-bone us, and I would find myself tense, gasping, bracing for the inevitable collision as our taxi moved with less than a second to spare. When we lived there, things like this didn’t bother me. I rather liked the excitement of the near miss. But on this trip I spent a lot of our time in taxis tensing up and feebly fumbling for something to hold on to–the edge of the seat, the door handle if available, anything. My heart pounded. Pitiful. Morocco has spent the last 3 years attempting to re-do its driving. Right about the time we were leaving, they were introducing a system of “points” where you could lose points for various infractions, although how on earth this would be enforced remained unclear. Foreigners had to get a Moroccan driver’s license, whether or not they really spoke French or Arabic. Supposedly this would make everything calmer, more civilized. 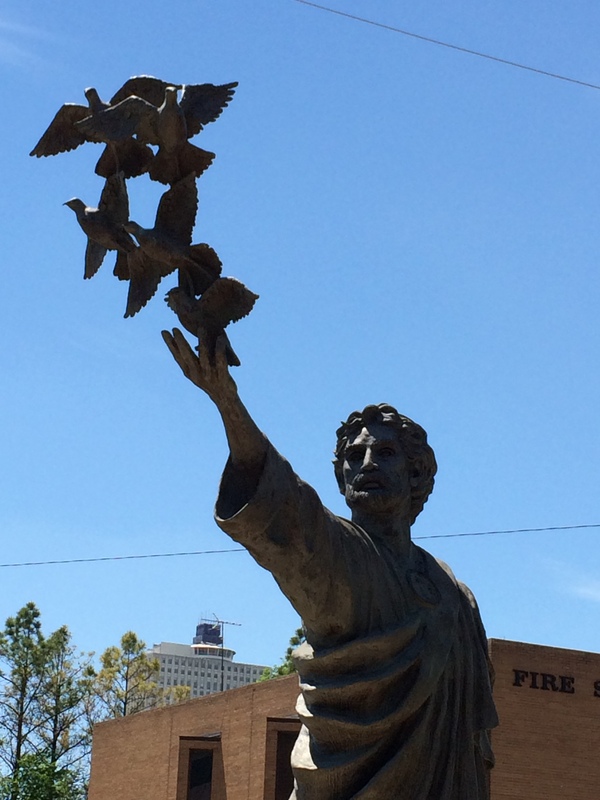 I had visions of intersections with drivers saying, “No, you go first. Please” instead of charging ahead, guns blazing, so to speak. On this trip, there came a moment when we were in a taxi heading downtown and I realized that everyone was waiting in his or her own proper lane. There were supposed to be 3 lanes–there were 3 lanes, instead of the normal 5 or 6. “Wow, it’s really working,” I thought. The traffic light changed, everyone surged forward, and within 2 seconds I realized that actually nothing had changed. Battles were still being fought over inches of pavement space. The only difference was my stress level and, apparently, gullibility. By the time we got to Mauritania, I’d pretty much adjusted back. Donn’s friend Mohammed, who is doing really well for himself, loaned us a car for a few days. It was just like old times, driving around town, getting stuck in pointless traffic jams where the only way out is to join in and fight for those inches of progress, singing “Anarchy in the UK” (Sample lyrics: I know what I want and I know how to get it) as we wove our way in and out of oncoming traffic. It was Oregon that was once again the shock.